Here are some group photos from the two meetings in Xiamen, China. 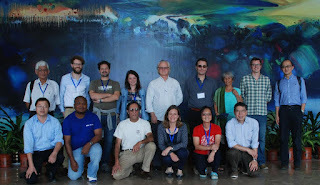 The larger group shot was from the symposium he;d Nov. 12-13, and the smaller group shot was from the meeting of the Mangrove Specialist Group held Nov. 14-15. During the symposium, one of the presenters dealt with the importance of mangrove associates, including mangrove associates and epiphytes such as orchids in ensuring a healthy, bio-diverse mangrove ecosystem. It had not occurred to me just how vital these associates and epiphytes were in producing a healthy mangrove wetland, including ensuring adequate pollination of mangroves and overall plant health. The flowering plants such as orchids attract the insects that are important for pollination of mangroves. This fact further proves the case for not relying on plantations and mitigation as a way to replace a functioning mangrove system in one place with a planted or afforested one elsewhere, because it will take many years to establish the full mangrove community including the associates and epiphytes. Further surprise is that in China over 2500 ha of planted, introduced Sonerratia mangroves from Bangladesh have been established in China as a way to lessen coastal erosion and protect against hurricane winds and waves. However, this may not yet be an invasive species in China, as it turns out that the Sonerratia is not getting pollinated because of lack of available suitable pollinators in China. There are some plans to introduce such pollinators so this species can reproduce, but this raises the specter of yet another bio-invasive species there. China seems ripe for such bio-invasions as they attempt to introduce other species of plants to their coastal zones. Someone had earlier introduced the marsh plant Spartina (which grows naturally in the US) to China and because of lack of natural bio-containment, this species has become rampant in growth, actually threatening the native mangroves because of the thick growth of this invasive grass-like reed can choke out the mangroves in the area. Vast beds of Spartina spread rapidly in the shallow bay and estuary waters there. At present there is no program established to counter this threat, but again talk of introducing natural competitors such as insects to keep the Spartina in check are being discussed there, which could be problematic in establishing yet a new invasive pest to China's wetlands. During the MSG strategy session, I was able to get formal approval for my earlier introduced proposal for undertaking a global assessment of past and present mangrove restoration in an attempt to establish a best practices approach to mangrove restoration. This assessment will involve MAP, Robin Lewis of Florida and Norm Duke of MangroveWatch of Australia in the process. MangroveWatch will undertake the actual groundwork of assessing the success and failure of selected restoration sites. This is important because too often mangrove restoration projects are not monitored and evaluated, thus allowing bad practices to be repeated and promoted, funded by unsuspecting funders such as the World Bank to the tune of millions of dollars and thousands of wasted man hours in futile plantings. Because this failure to monitor and evaluate leads to around 70% or more failure rates, we are losing opportunity to reverse the ongoing negative trend in mangrove losses. Therefore, undertaking this kind of widespread study of restoration attempts in Asia, the Americas and Africa could well help positively influence future mangrove restoration programs, and we can be assured CBEMR approaches will get the positive attention they so long have deserved. This proposed assessment program is urgently needed as proven by current so-called "restoration efforts" in the Philippines, whereby a very expansive government program to afforest sea grass beds with mangroves is now in progress, or should I say "regress!!" Dr. Jurgenne Primavera, who is a board member of both MSG and the ZSL is leading the effort in the Philippines to oppose this destructive ecosystem conversion, but so far has not been able to convince authorities there to change their short-sighted approach. Hopefully, the proposed mangrove assessment will have some chance to affect policy there. For inclusion of recommendations to IUCN by the MSG, I will be working on a couple of recommendations, which I will ask others on this list to help refine. One will recommend against mitigation as a means to justify further mangrove habitat loss, and the other the recommendation to keep shrimp farms out of the inter-tidal zone, not just out of the mangroves, but outside the whole inter-tidal area. These one page recommendations will be reviewed by the MSG steering committee and may be included in their final statement of recommendations to IUCN. A next meeting in Florida next June of MMM4 will involve many MSG members, so this will be yet another opportunity to move our restoration and conservation efforts forward. I saw Jim in Thailand and Cambodia, discussing MAP issues with him, including the future of our MAP Asia office. I will be discussing some of the ideas we talked about with the board at the next meeting on the 25th. While traveling in Cambodia I visited a joint community-livelihoods project at Tonle Sap, meeting for the first time members of the PMCR group there whom MAP Asia has been working with over the last 10 years or so.They are establishing a very promising community savings plan, involving women's groups in the process of making small loans for small-scale community development projects, eliminating the middleman in the process.